The Dominican Republic is Simply Amazing! Ioana has completed three years of her Bachelor’s degree in Spanish, French and Media and Communication at Newcastle University in Newcastle, Great Britain. She is one of three students participating in the 2012 pilot of the InteRDom Correspondent Program, and is participating in the 2012 10-week Caribbean Summer Program, with special dates beginning July 1. You can read more about Ioana and her participation in the Correspondent Program here. Time in the Dominican capital flies extremely fast. There are so many attractive things to do and places to visit around the country that 10 weeks are just not enough. In this post I would like to talk about the activities that InteRDom has organized for us. There were various activities and I truly enjoyed all of them, as they represented an excellent way to get to know the Dominican culture, history and discover the beautiful exotic nature. One activity consisted of a Theatre Night. 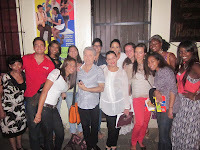 We saw the play called “El Resbalón de Julieta” at the small, local and very cute theatre “Las Máscaras”, in La Zona Colonial. The show was in Spanish, so it gave us the opportunity to get familiarized with the specific Dominican Spanish and learn more slang and expressions. What was very touching and special was the fact that at the end of the play we had the chance to talk to the actors and take some pictures together that will always remind me of that authentic theatre. The next activity was a trip to “El Sendero de Cacao,” a plantation of cocoa trees. Imagine that! This trip should be on the ”must see list” of each visitor to step on this part of Hispaniola island. The tour consisted of a walk around the plantation guided by one of the workers that explained every single step that has to be taken in order to obtain the cocoa powder and then the chocolate paste we all use for making cakes or prepare sweet drinks. Absolutely exciting! At the end of the tour we were explained and showed the process of making organic chocolate: black, white or with milk. We all received a little chocolate shape made in front of us, just for us. Isn’t it sweet? The “hacienda” also has a little shop were one can purchase little souvenirs, most of them chocolate flavoured. At the end we had lunch on the premises. I swear it was the best lunch I have ever had: local Dominican food, tasty and exotic. We were delighted to have as dessert a plate of seasonal fruit topped with melted chocolate. Yummy…! I would definitely go there again!! The other activity was a visit to the Museum of Resistance, movie afternoon and lunch. This was another cultural activity that introduced us to the sad history of Trujillo’s era. I learned a lot about the tyranny that characterized the dictator and how things used to be back in time. The movie we saw “In the Time of the Butterflies” was the ideal way to continue the visit to the museum as it helped us making a clearer idea about the political situation imposed by Trujillo. As I still have some time left to spend on this pretty island I am planning to travel and visit more, in order to accumulate as much information as it would be possible about the past and the present of this Dominican people and civilization. Insight of GDAE Seattle 2016! Time: Better Late With a Treasure? The blog also provides useful information for students and inspires lively debate and increased interest in exchange and the development of Hispaniola.